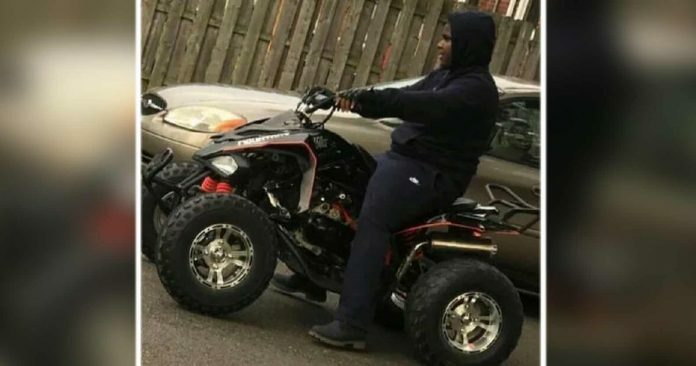 Warren, MI — Under no circumstances is it ever okay to fire a weapon, lethal or not, at an unarmed child who is controlling an ATV—especially if you are a police officer and you are also in a vehicle. However, that is exactly what happened in Warren, Mich. last weekend and now an aspiring high school freshman is dead because of it. Michigan State Police Officer Mark Bessner allegedly fired his taser from his police cruiser, striking 15-year-old Damon Grimes. Grimes then, according to his family’s lawyer, either died immediately from the 50,000 volts surging through his body, or died from the subsequent seizure which left him unable to safely control his all-terrain-vehicle (ATV) which crashed into the back of a pickup. Bessner was apparently trying to get the teen to get off of the roadway and thought it would be a good idea to deploy his taser from one moving vehicle to another (ATV). Since Grimes died as a result of the officer’s actions, it now seems the Michigan State trooper may not have properly thought through all of the ramifications of his actions before deploying the deadly taser. Under no circumstance should any police officer ever shoot like a cowboy out of his vehicle, out the window and shoot the young man who’s driving the vehicle. Bessner has been in trouble before for the way he has deployed his taser on other members of the public. Seeming more like a tyrant than an officer of the peace, the Free Beacon described his two prior lawsuits involving his use of the department-issued taser. Bessner has been sued in the past for using excessive force. Since 2013, two different civil lawsuits, both involving Tasers, have been filed against the 43-year-old for excessive force. The first, which was filed in 2013 in U.S. District Court in Detroit and settled a year later, alleges that Bessner “repeatedly struck” and “gratuitously kneed” an unarmed plaintiff, who was never charged with a crime. The second case, filed in Wayne County Circuit Court in 2015, alleges that Bessner Tased the plaintiff on “multiple and continuous occasions with the specific intent of inflicting pain,” including after the plaintiff was in handcuffs. Flanked by Damon’s mom and dad, Fieger said the person solely responsible for the young teen’s death is the trooper. The family’s lawyer described the federal civil rights lawsuit under the Section 1983 of the Civil Rights Act and accuses the officer of “gross negligence” under Michigan law. The attorney indicated the cause of death is still unknown as a second autopsy is still being conducted. “Absolutely mind-boggling stupid” is how Fieger characterized the “drive by shooting” of a “child on an ATV shooting him with a taser”. Grimes died last Saturday, August 26th, after Bessner attempted to get the boy to direct his ATV off of the roadway. At the time of their son’s death, the family believed the officer involved in the incident actually rammed their son with his cruiser, sending the ATV careening into the back of the pickup truck. Now, after presumably examining the police report, they now know Bessner killed their son by deploying his taser from one moving vehicle to their child who was alive and well until his run-in with police.